I love a little sleuth work! After posting the image above, I became obsessed with finding out which magazine it came from. My only clue was the word 'fabric' on the top left corner of the page. This looked like Southern Accents to me; they use this font, and often have the category of the article formatted like this. I looked through years of Southern Accents (so that is why I keep those old issues! ), to no avail. I then turned to my Traditional Home stack. Nothing. It did not look like House Beautiful or Veranda. I knew that I had saved this from a blog, so I looked through quite a few of my favorite blogs. Nothing. Then, I turned to a blog that I had not read in a while. I am not sure why it had gotten out of my rotation, as it is a great blog: An Eye for an I:nterior, one of my first design blog discoveries. A few months ago, she featured the amazing photographer John Gruen, whose images are featured below. He has an amazing eye and his compositions are beautiful. It turns out that his picture is from a magazine called At Home, which is a Fairfield County Connecticut local publication. Mystery solved! Coincidentally, a few days ago An Eye for an I:nterior posted about the importance of professional interior photography in the design profession. 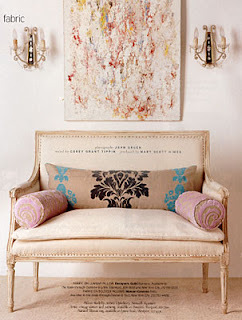 There is truly an artform to capturing interiors, and John Gruen is a master of his profession. I have been seeing a lot of branches used as decor lately. It is a beautiful, sculptural look. Love the wallpaper too. Photography by John Gruen. Light filled room - so hard to photograph well - architectural simplicity. Photography by John Gruen. These stairs make a statement! I love the runner...usually you see the dark part framing the light part, but this is the reverse. Photography by John Gruen. This looks like a very elegant artist studio; notice the paintbrushes in jars on the chest. Photography by John Gruen. A beautiful white room with dark floors- slipcovered sofas, very simple. The skilled photography and angle of the shot really capture its beauty. This was a very fun post. And so true. I find that in interior design or any sort of artistic work, if you can't take a good photograph, it is hard to show people how the project really looked. Unless you have your work featured in magazines or professional publications! I have hardly any worthy photos from past projects because of my serious lack in ability to photograph it properly. Nothing ever looks quite as beautiful as it does in in real life. Photography is an art all in itself! I am now realizing how important this is and have started to make photographing my work as important as the project itself. Thanks for the lovely photos and pointing me to that design blog. I can't remember if I have been there or not so I am off to check it out! You have a very inspiring and fun blog! Please pay me a visit and read about the extraordinary designer exhibition Casa Cor that is taking place in Stockholm right now. Please also spread the word about it - I need all the marketing help I can get :-)! Thank you for the comments! I have just changed my posting name to Things That Inspire, to match my blog name. Some great images here that really do show how important good photography can be. It's funny, I was just on Jenn's blog this morning reading about photography! What a beautiful blog. I love all of these images but especially the stair runner.....absolutely stunning. Thanks for stopping by my blog. I agree that the wrapping and presentation of a gift is as much fun as the gift itself. What a great photographer, all of those images are stunning. I could not agree more about the importance of professional photography. It is so disappointing to find a wonderful room that has not been captured well. Not only have you posted terrific examples, but nice looking rooms as well. I love the one with the mirrored cabinets. He obviously has great designers to work with as well! It is always a special relationship between the designer and the photographer.